Tomorrow the Tour de France 2018 will start in Noirmoutier-en-l'Île, the start of a 23 days adventure with 21 stages for 176 riders (you can find the detailed race route here). Less riders than usual, 22 less to be precise, because the number of riders per team has been reduced from 9 to 8. This article has not been translated into English, but you'll find below the list of 199 participants in Paris-Roubaix 2017, with their names, nationalities and bib numbers. La 115ème édition de Paris-Roubaix partira demain matin de Compiègne, pour 257 kilomètres de course en direction du vélodrome de Roubaix. 55 kilomètres de pavés feront vibrer les 199 coureurs qui se présenteront au départ demain matin pour les 25 équipes qui participent à l'Enfer du Nord ! Dans cet article vous trouverez l'ensemble des coureurs partants ainsi que leur numéro de dossard pour chacun d'entre eux. Philippe Gilbert wins the Tour of Flanders 2017 with a long final solo! The 101st edition of the Tour of Flanders didn't work out as usual ... 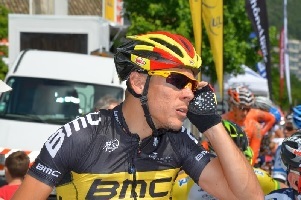 Indeed, even though as usual we saw a first leading group going off rather quickly, the Wall of Geraardsbergen (Mur de Grammont) saw the race explode and Philippe Gilbert ended up in the right chasing group behind the leading group. Once in the lead with the initial breakaway, Gilbert decided to attack in the "Oude Kwaremont" and he ended up alone leading the race at a bit over fifty kilometers from the finish! Despite that huge remaining distance, the Belgian Champion manages to resist to the chasing riders behind him and he thus wins this race for the first time in his career! Today the 101st edition of the Tour of Flanders (or Ronde van Vlaanderen as it's called locally!) took place. Tonight, the Tour of Spain, the Vuelta a España 2016, will start, with a 29.4 kilometer long team time trial, in the province of Ourese. In this article, you'll find the start order and -times of the different teams for this time trial, as well as the complete participants list with all the riders of the different teams with their bib numbers. The first stage, which will thus take place tonight, will be a race against the clock, for each of the 22 teams which participate in this Tour of Spain. Starting in Compiègne, the weather should be dry but potentially still with some fog which will disappear progressively. While early this week the weather reports still mentioned rain during the race (which would have been a first since several years! ), this will finally not be the case and the riders will thus get on the cobbles towards Roubaix under a dry sky, but without much sun. 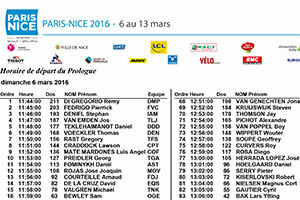 A 9 rider strong breakaway lightened up today's queen stage in Paris-Nice 2016 between Nice and La Madone d'Utelle. Antoine Duchesne (Direct Energie) was again present in this breakaway, like yesterday, and went off to collect some points for the King of the mountains classification, which allowed him to put on the polka dot jersey at the end of the afternoon. The stage victory was decided in the final climb and a small group of favourites battled for it in the last few kilometers. The rider who won the stage was however probably the one we expected the less in this group, the Russian rider Ilnur Zakarin (Team Katusha). Geraint Thomas ended the stage at the second place and takes the first place in the current general classification provisoire, the day before the final stage! Tomorrow, Paris-Nice 2016 will start with the 6.1 kilometer long prologue in the streets of Conflans-Sainte-Honorine, followed by 7 stages in line which will bring the riders to the usual finish in Nice (see the Paris-Nice 2016 race route on Google Maps). Except unexpected circumstances, 175 riders will come to the start (22 teams of 8 riders each, except for Lotto-Soudal which has one less) tomorrow and in this article you'll find all of them, including their bib numbers, but also the start order and -times of the prologue in Conflans-Sainte-Honorine. This Sunday 11 October 2015, it's time for the usual end of the season classic in France already, the 109th edition of Paris-Tours, which is also known as the classic of the falling leaves, just like its big brother Il Lombardia which took place last week. This year it'll take place between Chartres and the Avenue de Grammont in Tours. As usual, this classic is one of the last races of the season in France and the riders will thus want to show off before they get to their winter rest period. In this article you'll find all you need to know about this end of the 2015 season classic: the race route, the map on Google Maps and a downloadable version in Google Earth of the race route, the profile and the time- and route schedule. You'll also find the participants list with the bib numbers. John Degenkolb wins the 'pavé' of Paris-Roubaix 2015! John Degenkolb (Team Giant-Alpecin) probably dreamed as much of it as Bradley Wiggins (Team Sky). While the British rider would have hoped to end his professional cycling career on a victory at Paris-Roubaix, the Germand rider kept in mind the bad taste of the second place last year. As one of the riders in a small groupe of 7 riders at the entrance of the Vélodrome in Roubaix, John Degenkolb showed his sprinters qualities and thus managed to cross the finish line first when the breakaway crossed it for the second time on the track! After several unsuccessful breakaway attempts,, nine riders formed today's breakaway after an attack at kilometer 34 under the sun which was shining on the roads of Paris-Roubaix 2015 today! Alexander Kristoff (Team Katusha), Niki Terpstra (Etixx-QuickStep), Bradley Wiggins (Team Sky), Sep Vanmarcke (Team LottoNL-Jumbo), Greg van Avermaet (BMC Racing Team), Sebastian Langeveld (Team Cannondale-Garmin), Peter Sagan (Tinkoff-Saxo) or Lars Boom (Astana Pro Team) or even some other outsider ... the list of potential winners of Paris-Roubaix 2015 is quite long since there's no real favourite. The first reaction of Niki Terpstra, first Dutch winner of Paris-Roubaix after Servais Knaven in 2001, maybe best resumed the Hell of the North, version 2014. Indeed, after the queen of the classics, the rider of the Omega Pharma-QuickStep team, declared being very happy .. and very tired! It was a fatiguing race which remained undecided until the end on the cobbles between Compiègne and the Vélodrome of Roubaix this afternoon which didn't see the big favourite Fabian Cancellara (Trek Factory Racing), but a Dutch rider win this race for the first time since 13 years! After Fabian Cancellara's victory in a sprint of 4 in the Tour of Flanders last Sunday, we'll see in the Hell of the North this Sunday whether Spartacus can make it, like in 2010 and in 2013, a combination win of both races! 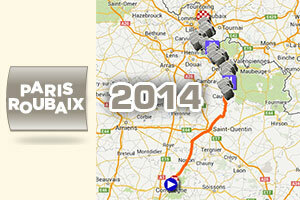 In this article you'll find the Paris-Roubaix 2014 race route on Google Maps and in Google Earth as well as the details of the 28 cobble stones sections which will be part of this 112th edition of Paris-Roubaix and in which we see some changes compared to last year. The race route will be slightly different from last year: there will now be 28 cobble stones sections (one more than last year) and with 257 kilometers, the total distance is hardly any longer. Fabian Cancellara wins his 3rd Tour of Flanders! It was today that the Tour of Flanders - or Ronde van Vlaanderen or even "Hoogmis" (the High Mass) as the Belgian call it - took place with its 98th edition between Brugge and Oudenaarde. A race which led to numerous crashes but most of all with the suspense which makes us love these Belgian classics! After 259.8 kilometers, it was finally Fabian Cancellara who crossed the finish line first. 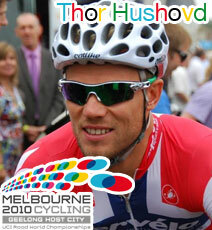 The Swiss rider thus won the Tour of Flanders for the 3rd time! The Tour of Flanders 2014 started in Brugge with a bit of rain at 10.15AM. 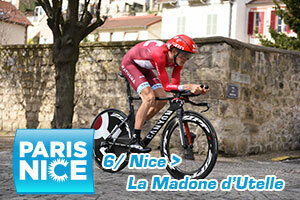 This Sunday, the 72nd edition of Paris-Nice will start and run 8 stages in line over the longest distance in the history of the race since it takes place in 8 days (9 before). 168 riders will come to the start (including 36 young riders who can pretend to the white jersey), representing 27 nations. In this article you'll find the names of these riders, together with their bib numbers which allow them to be identified in the race! 27 nations will be represented by 168 riders at the start of Paris-Nice 2014, in 21 teams, with the most riders coming from France (43 riders), Belgium (18), Italy (16), The Netherlands (14) and Spain (10). 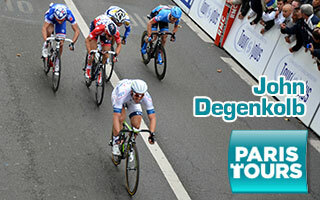 Paris-Tours 2013 ends in a sprint: John Degenkolb wins! In the last race in line of the season in France, a group of 4 riders quickly got away from the peloton but in the end Aleksejs Saramotins (IAM Cycling) was the only one who managed to stay ahead. Unable to resist to a peloton which wanted the race to end in a sprint, the rider of the Swiss team was finally taken back as well. Several new attempts failed, except for the one by Jetse Bol (Belkin) who was still alone ahead when he arrived on the Avenue de Grammont in Tours but the Dutch rider couldn't resist to the peloton either and finally John Degenkolb (Argos-Shimano) won Paris-Tours 2013 in a sprint! 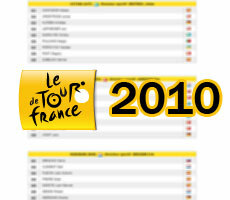 The list of participating riders in the Tour de France 2013 and their numbers, who will follow up on Bradley Wiggins? 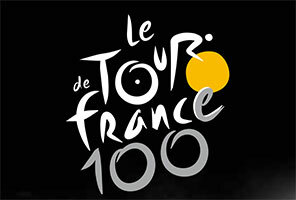 Tomorrow will see the start of the Tour de France 2013, hundredth edition! It's therefore time for us to have a quick look at the participating teams: 22 teams of 9 riders together form a peloton of 198 riders. They will get together for the start of the first stage this Saturday in Porto-Vecchio (see the Tour de France 2013 race route in detail on Google Maps). 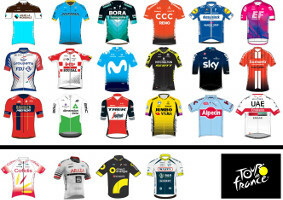 Let's have a look at these 22 teams and more importantly the leaders among the 9 selected riders for each of them. 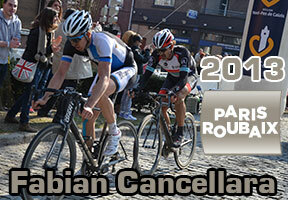 Fabian Cancellara takes his 3rd victory of Paris-Roubaix in its 111th edition! Spartacus kept his promises. Despite a race with many changes all along the day, the Swiss rider Fabian Cancellara managed to get in front of the race at the right moment and by beating in the sprint the young Belgian rider Sep Vanmarcke he goes home with his third souvenir cobble stone! Despite that the sun was shining bright already at the start of the 111th edition of Paris-Roubaix, the riders only timidly came to sign in this morning. The big favourite, Fabian Cancellara (Radioshack-Leopard), was the last to sign the presence sheet, in his mind already looking towardss the vélodrome in Roubaix. This article has unfortunately not been translated in English. 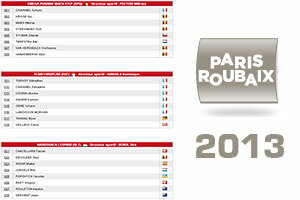 However, you can find below the list of participating riders in Paris-Roubaix 2013 and their bib numbers, together with a French presentation. C'est aujourd'hui que l'Enfer du Nord, la 111ème édition de Paris-Roubaix, verra 198 coureurs de 31 nationalités se présenter au départ pour avaler les 254,5 kilomètres dont 52,5 kilomètres en 27 secteurs pavés figurant sur le parcours de Paris-Roubaix 2013. 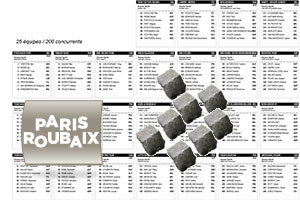 Ici vous trouverez la liste officielle des partants de Paris-Roubaix 2013, y compris leurs numéros de dossard. Vous trouverez également des informations pour savoir comment suivre Paris-Roubaix 2013 à la TV. 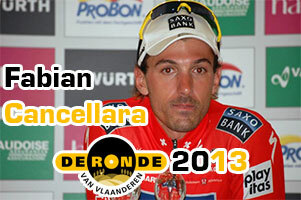 Tour of Flanders 2013: the victory for .... Fabian Cancellara! A Tour of Flanders not like the others, with last year's winner, Tom Boonen, who had to abandon the race after having crashed only 19 kilometers after the start of the race. Not like the others also because of how the race unfolded: the breakaway was formed quite late in the race and it was also taken back quite late. It finally fell apart little by little and Fabian Cancellara turned out to be the only element which made this Tour of Flanders like the other editions, like the 2010 edition to be precise because the Swiss rider today won his second Tour of Flanders! The Tour of Flanders 2013 took place today under dry but very cold weather, from the start on the Market in Bruges where 205 riders got away for 256.2 kilometers towards the finish in Oudenaarde. 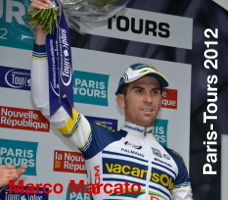 Paris-Tours 2012 didn't end in a sprint, the final breakaway continued till the end! And in this breakaway, one rider was looking for revenge, Marco Marcato (Vacansoleil-DCM Pro Cycling Team), who finished second behind Greg van Avermaet (BMC Racing Team) last year. The Italian rider won the race this afternoon in the Avenue de Grammont in Tours with the second* fastest average speed in the history of Paris-Tours! This morning at the start of Paris-Tours 2012 in Châteauneuf-en-Thymerais, the sun was having some difficulties getting through the clouds and the riders thus started under a grey sky but with dry weather in this 106th edition of Paris-Tours. This week in the Tweets of the week, we'll have a look at the most interesting, funny, disturbing or original Tweets since August 19th. 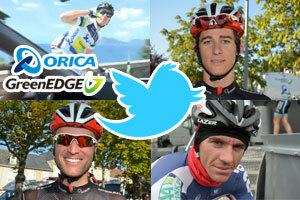 These are thus somehow the Tweets of the month in which we'll have a look at the original video "Call me maybe" of the Orica-GreenEDGE team during the Vuelta a España, the varying result of the team time trial in this same race and the high temperatures in the Tour Poitou-Charentes. And let's not forget the original names of riders, the famous Tour of Hangzhou, speeding riders, attacks by Alberto Contador and the refusal of a new iPhone 5. And still, I haven't mentioned everything! 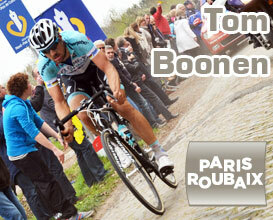 Tom Boonen solo wins Paris-Roubaix 2012: a 4th victory! The biggest favourite of all, Tom Boonen, showed today in Paris-Roubaix 2012 why it was logical that everyone wished him a 4th victory. When things got serious in the race, the rider from Mol in Belgium decided to make it a solo race for no less than 53 kilometers, finishing it off with a mandatory lap but which actually became a lap of honour in the Vélodrome of Roubaix! With this 4th victory we're sure Tom Boonen now really says "I ♥ RBX"! This article and the numerous photos you'll be able to find in the Paris-Roubaix 2012 photo category in the photo section, were made possible thanks to Go4Cycling, a small company which organizes VIP trips in the spring classics and which kindly offered me the opportunity to get on board of their trip in Paris-Roubaix today. 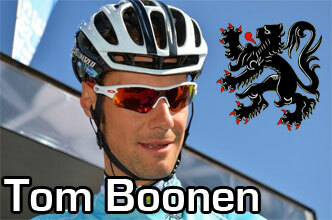 The Tour of Flanders 2012 for Tom Boonen as well! The Tour of Flanders 2012, Flanders' most beautiful, even with a modified race route, was won by Tom Boonen today when he finished easily ahead of the Italian rider Filippo Pozzato with whom he was in the final breakaway, together with number 3, Alessandro Ballan. Finally it was not the race route which put his main competitor Fabian Cancellara out of competition and it was not the power of the Belgian rider either but an unfortunate crash of the Swiss rider who will yet again not reproduce his 2010 classics season. 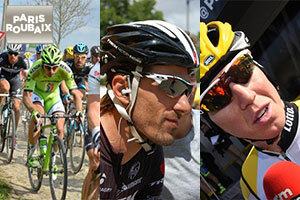 You most probably already watched a cycling race on TV? The Tour de France, Paris-Nice or the Amstel Gold Race are just some examples of cycling races which are broadcast on TV. But how do the images of the riders get to your home? The Dutch show Het Klokhuis recently showed this, based on the images of the Amstel Gold Race ... 2006. In its show on 29 October, Het Klokhuis, a TV show which mainly targets young children, showed how such a TV broadcast is done. 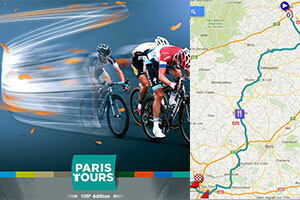 This Sunday the 104th edition of Paris-Tours will take place between La Loupe and Tours. This Classic of the falling leaves is one of the last races of the season and the riders will thus want to shine for the last time before the winter break. 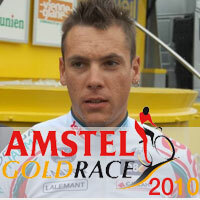 The race was won by Philippe Gilbert in 2008 and 2009. Will the Belgian rider be able to complete his triple this Sunday? In this article you'll find all you wanted to know about this end of season classic: the race route on Google Maps and a downloadable version for Google Earth, the time and route schedule, the 25 participating teams and the list of participants with their numbers. Tonight at 10.04PM the Vuelta a España 2010 will start in Sevilla with a team time trial. Indeed, the Vuelta a España celebrates its 75th anniversary by starting with a nightly stage which will finish for the last team only at 11.42PM!! 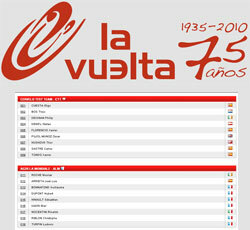 In this article you'll find the list of participants à la 65ème édition du Tour of Spain ! 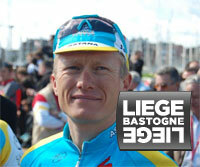 The Doyenne des classiques, Liège-Bastogne-Liège, was today the last of the spring classic races. In Ans Alexandre Vinokourov (Astana) was the first to cross the finish line with a comfortable gap on Alexandr Kolobnev (Team Katusha). The 258 kilometers of this classic have been raced under quite good and sunny weather conditions with an average speed of 38.9 km/h. 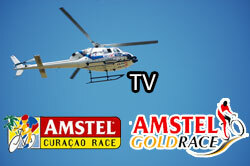 Today you could follow the Amstel Gold Race 2010 live on www.velowire.com thanks to the NOS! This Dutch classic, part of the UCI ProTour, started this morning under a bright and shiny sun in front of many spectators on the Market in Maastricht. After 257.8 kilometers and 31 climbs, Philippe Gilbert (Omega Pharma-Lotto) crossed the finish line as the winner on top of the Cauberg! On Friday you have discovered the Amstel Gold Race 2010 route here, today at the evening before the race, you can find here the list of participants. This list is the official list as presented by the organiser of the Amstel Gold Race, knowing that Eyjafjallajökull (what a name for a vulcan in Iceland!) has heavily influenced the presence of certain riders who had some difficulties in getting to the south of The Netherlands because of the closed airports while some of them have not been able to come at all. This article has not been translated in English. 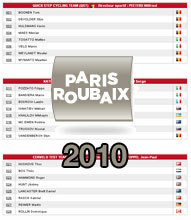 However, you can still consult it below to discover the full list of participating riders to Paris-Roubaix 2010 and their numbers. Au vue de l'immense popularité de mon article avec le parcours et l'itinéraire horaire de Paris-Roubaix 2010, je me suis dit que la liste des partants et leurs numéros de dossard allait également vous intéresser ! En cadeau, je vous donne également les liens vers les interviews avec quelques uns des coureurs qui seront aujourd'hui au départ de Paris-Roubaix 2010 à Compiègne. 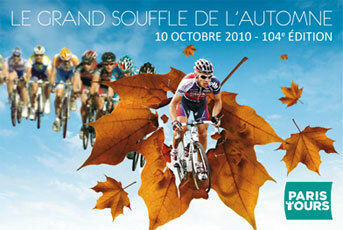 Tomorrow Paris-Tours 2009, also known as the Classique des feuilles mortes: the classic of the falling leaves, will take place. The start of this 103rd edition is for the very first time in Chartres. In this article you'll find all you wanted to know about this end of the season classic: the full route, the route in Google Maps and a downloadable version of the route in Google Earth, the full itinerary and times, the 25 participating teams and the list of participants with their numbers. Since 1994 Paris-Tours always started in Saint-Arnoult-en-Yvelines. On 9 September however, A.S.O. 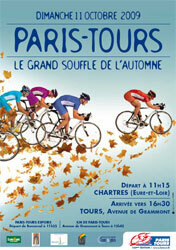 signed a contract with the Eure-et-Loir department for the organisation of the start of Paris-Tours from 2009 till 2013. 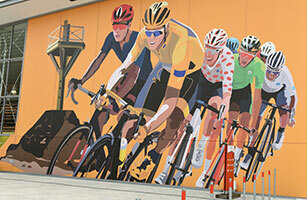 Only 11 days to go before the first kilometers of the 96th Tour de France will be done in and around Monaco. 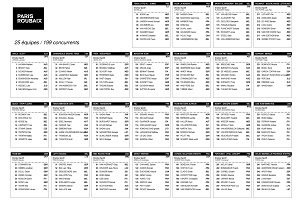 Therefore, it's the time of the year when you can discover the list of participating riders in the Tour again, here for the Tour de France 2009! 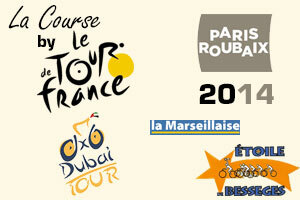 In this article you'll find the (pre)selections of the 21 teams of the Tour de France! As soon as their numbers will be announced they will be published here as well. Now the Giro d'Italia 2009 is over, all cycling fans' eyes are pointed to ... Nancy where the first stage of the Critérium du Dauphiné Libéré will take place on Sunday. The Critérium du Dauphiné Libéré is a mini Tour de France, a one week stage race which is used by some riders as their final preparation for the national championships and for the Tour de France. In this article you'll find exclusive maps of the Dauphiné Libéré route in Google Maps and a downloadable version for Google Earth. 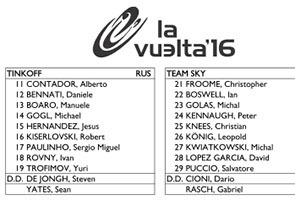 In addition, this article contains the full list of selected riders and their numbers! 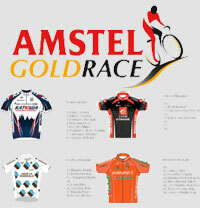 Today the 44th edition of the Amstel Gold Race took place around Maastricht and Valkenburg in The Netherlands. Sergei Ivanov (Katusha) won this Dutch classic before Karsten Kroon (Saxo Bank) and Robert Gesink (Rabobank). When they exit Maastricht (where there were strangely very few people, especially compared to the start of Paris-Roubaix in Compiègne (photos)) four riders immediately quit the peloton, including Kristof Vandewalle (Topsport Vlaanderen), Reinier Honig (Vacansoleil) and Thierry Hupond (Skil-Shimano). 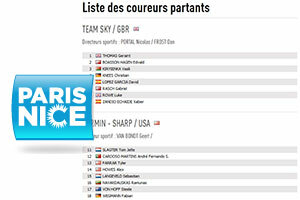 Yesterday you could find here all information about the first stage in Amilly of this 67th edition of Paris-Nice. Today the second stage took place between Saint-Brisson-sur-Loire and La Chapelle-Saint-Ursin over a distance of 195,5 kilometers (see here for all information about the Paris-Nice route). If I would summarise this stage in three words those would be escape, fall and sprint. At the end of November 2008 I published the first version of my article about the rumours of the Paris-Nice 2009 route. As it has now become usual, together with the help of some of my loyal readers (thanks Franck ! ;-), I regularly updated this article as soon as new rumours were published and in the end ... when the route was finally officially anounced on 29 January it turned out to be 100% correct with all start and finish cities of all 8 stages ! That's why I decided not to update my article with rumours but to focus on the creation of a map with this full route of Paris-Nice 2009 in Google Maps / Google Earth. From now on you can exclusively discover the result at www.velowire.com ! It's the time of the year again in which the cycling teams for the new season 2009 get presented ... That is because the presentations are planned just before or just after the Tour Down Under (18 till 25 January) now it's part of the UCI ProTour. Just like Rabobank with its pure combativity last Monday, the Milram cycling team also presented itself on Wednesday 7 January with a slogan: everything new, everything different! And indeed the only German cycling team which is left (at ProTour level) -after the disappearance of Gerolsteiner and the transfer of T-Mobile which has become High Road and than Columbia to the United States- indeed has a lot of new and different things in 2009! ... to start with the riders: many riders have left and no less than 14 new riders arrived. On this blog I regularly talk about the Tour de France (with for example the full Tour de France 2008 track in Google Earth or the changes in official partners/sponsors of the Tour de France), but did you know that a little bit less than a month before the Grand Départ of the Tour from Brest a sort of miniature Tour de France will take place from 8 till 15 June 2008? The experts will have understood by now that this article is about that miniature Tour which is called the Critérium du Dauphiné Libéré. Just like last year for Paris-Nice 2007, the 66th edition of Parijs-Nice again became one full of suspense until the very end! Indeed, this morning before the start of the last stage Nice > Nice, the difference between the two first riders in the general ranking - the Italians Davide Rebellin of Gerolsteiner and Rinaldo Nocentini of AG2R La Mondiale - was only three seconds. The prologue of this Paris-Nice 2008 was one under a grey sky and with some bits of rain ... the weather heavily influenced the first general ranking of this race to the sun with Thor Hushovd as the first winner. Today the German team Team Milram presented its team for 2008. New for the team are especially a new organisation, a new base for the team in Dortmund, a younger team, new goals and an even more important anti-doping programme. Gerry van Gerwen, the new general manager of the team said: I am happy to present a German team that, with it’s high number of young riders, offers a high potential for the future. Team MILRAM’s new organisation stands for the new way in cycling. Since the Italian company Ciclosport was sold to VeloCity GmbH Team Milram has moved to the base of its new owner in Dortmund. To allow a closer contact and a better co-operation with the riders Van Gerwen wants the riders to come to Dortmund and its vicinity to live and train there.